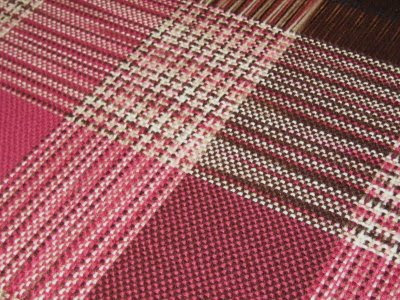 Weaving on my plain weave shawl got me to thinking about weaving with space dyed yarns again. The shawl's slubby yarn created a lovely visual pattern that I thought would be even lovelier in color. 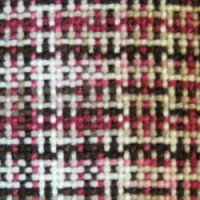 In the past, I've experimented with space dyed yarns as either warp or weft. As warp, I tried to create an ikat-like effect by grouping sections of like colors together (click here for how I did that) . As weft, space dyed yarns seem to end up being more random looking. (Example here). 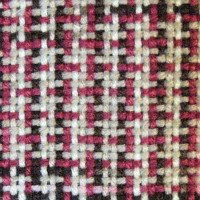 This time, I'm using the space dyed yarn in both warp and weft, alternating it with sections of fuchsia and brown. I'm using commercial worsted weight acrylic knitting yarns sett at 8 epi. They are inexpensive, fun to experiment with, and make good gifts for folks who want something they can toss into the washer and dryer. This is fairly good size, 45 inches wide on the loom. I plan to make it a little longer than square, and will probably finish it off with a crochet edging. I love that! What a good idea. This is really neat. It works beautifully for these thicker yarns. It is really the first time that I can remember seeing space-dyed yarns used well (excluding Bonnie Tarses' fake ikat). 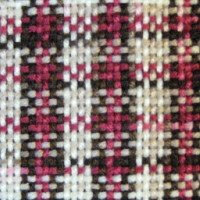 There are so many possibilities with colour and weave effects... this is looking really interesting Leigh, you're making something subtly original and distinctive, what fun weaving is! More challenges for me and going through those links, I realize that I need to hang onto my 8-harness loom even if three loom seem excessive. I need to at least try point twill on 8 harnesses. That rainbow-dyed warp is singing a siren's song in my ear. What specific yarn are you using? I like the colorway. I also like the effect of the space dyed yarn. Do you do anything to try to keep the continuity of the color, like wind all of the bobbins at once and start weaving with the last bobbin wound and work your way back? Thank you Alice, Peg, and Dorothy. Sharon, I have to warn you that rainbow-dyed warp is addicting to start weaving with! Patrick, I'm using Red Heart's TLC Essentials. This particular colorway is #2982, "Choco Cherry." I just happened to find it on clearance at Hobby Lobby awhile back and bought it all. For this particular project, I'm just taking the yarn off the skein as it comes. 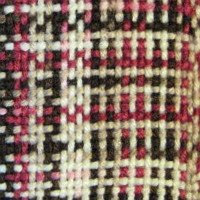 It's much easier for me and a lot of fun to weave. Your weaving is so beautiful!! I just can't wait to get a loom. And what Leigh means by addictive is that it is almost impossible to pry yourself away from the loom.....! How fun, Leigh! And boy do I hear you about gifts that someone can just toss in the washer and dryer. I've been procrastinating on making a couple of baby blankets because I know the young mom's will want to toss them into the washer and not have to be fussy about them. The space dyed, sure gives a more fun look. I love the color - weave effect on this blanket. Good idea to use acrylic yarn especially if you know the person getting the blanket will toss it in the washer and dryer.